Resilient flooring options are growing by leaps and bounds. Perhaps the biggest growth in this type of flooring are the options known as waterproof composite flooring. Simply put, these floors can go places other floors can't. Before you buy resilient flooring, check out these three things about waterproof composite flooring. Some manufacturers call it enhanced vinyl plank or engineered luxury vinyl. Whatever you call it, it is a composite flooring made from materials that are waterproof and rigid. It has a top vinyl layer that adds cushion and comfort and sound absorption. It's a solid floor that is quiet underfoot and able to stand up to just about anything life has to offer. It really is. 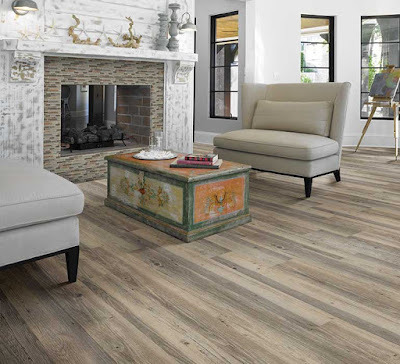 Designed with a locking technology that keeps liquids from seeping into and below the floor, waterproof composite flooring lets you pick any floor you love for any room in your home. Thanks to its waterproof qualities you can have the look of wood, stone or ceramic installed in your basement, your bathroom... or any room of the house. The built-in moisture repellant qualities of WPC also make it a perfect floor for pets. It can handle accidents, spills from water bowls while also being tough enough to resist scratching from claws or dirt tracked in on paws. Where can WPC be installed? Because of its rigid planks, WPC can be installed over most subfloors with minimal preparation. It can also be installed in large rooms without the expansion gaps that are required for laminate floors. Installation requirements for WPC flooring are minimal and make it a great floor for those challenging flooring areas in your home. The strength and beauty of wood with the durability of luxury vinyl planks. Manufacturers such as Mohawk and Shaw are developing truly gorgeous floors that are amazingly resistant to the scrapes, scuffs, spills and stains of everyday life. Waterproof composite flooring is the perfect example of just that. Stop by Kermans Indianapolis flooring store before you buy luxury vinyl flooring and check out our offerings of WPC flooring. More and more homeowners are discovering the many benefits of hard surface flooring. Flooring such as tile, hardwood, luxury vinyl and stone work well with many of today's design trends. Add in the fact that these flooring choices are easy to clean and long-lasting and you have a floor that works well in many homes.